Today we’d like to introduce you to Jaime Wiggins. Amazeballz is the best dream I never knew I had. I was in the corporate world for about 20 years. I have always had a sweet tooth. When I heard about cake balls in the summer / fall of 2012, I thought that was the greatest thing ever! Like diet cake. LOL So I decided to try to make them at home. Each time I tried a batch I thought of another way to try it next time until I was finally happy with the end result. I put some aside for my husband and I and brought the rest to my office. Each time we had a pot luck I was told to bring cake balls. Thanksgiving 2012 a coworker asked if she could pay me to make them. I said yes and the rest of my office wanted some too. I ended up with 25 dozen in orders. When everyone returned from the Thanksgiving break that all told me they are required to bring them for Christmas and asked when I was taking Christmas orders. For Christmas, I had 45 dozen in orders! It was amazing! January came and people I didn’t know started asking for some. My brother convinced me to start a Facebook page in January and see what happens. I had 65 dozen in orders for Valentines. Every day I went to work from 8-5, came home and had dinner with my husband and then got in the kitchen to work on orders. March of 2013 I convinced him to let me quit my job and give this crazy idea a try! I was a home baker for a year before we realized my kitchen way too small and needed a bigger place. So in April of 2014 I rented space in a commercial kitchen. We quickly outgrew that space and found a space we could call our own. 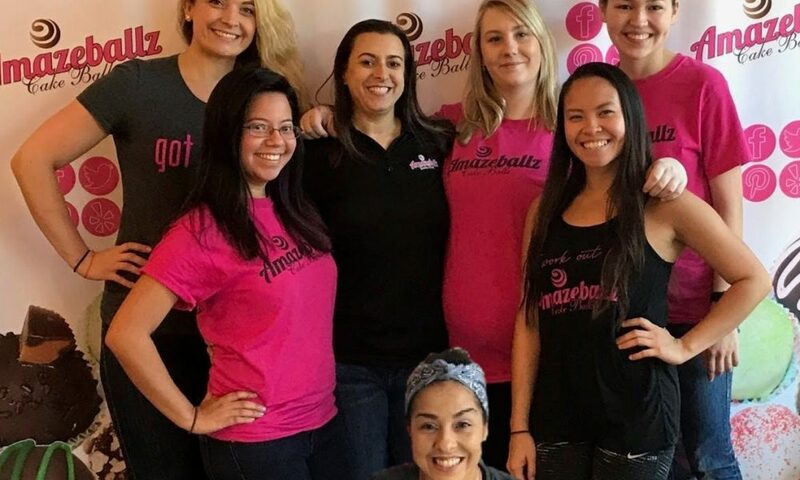 We opened the first Amazeballz location in Downtown Plano in May of 2015. In October of 2016 we opened the 2nd location in Firewheel Mall in Garland. We have already outgrown the Plano kitchen and are currently in construction of our 3rd location in Allen! This location is more than 3 times the size of Plano and will be a retail / production facility. Plano and Garland will be retail only locations. I have the best staff I could have ever asked for. We are a family. There is no way I could have gotten to where I am today without them. 3 stores in 3 years! Amazeballz! The best dream I never knew I had. Building our first location…. we were very naive. It cost way more money than we expected. Getting the money was an obstacle. Employees are also a struggle. Most people see it as a job. The girls I have now, it’s their life! They want to grow it with me and own their own Amazeballz location one day. We have learned so much after building the first location, however #2 and #3 have had their fair share of obstacles as well. Amazeballz – what should we know? What do you guys do best? What sets you apart from the competition? I make one thing and I make it well… cake balls. When we first opened, that is all we made. As time went on and we constantly got asked to make more and more items, I realized we needed to expand. I started hiring experienced decorators and we branched out into cakes, cupcakes, cookies and custom cake balls and pops. While we currently do everything, we still specialize in cake balls and cake pops. The one thing we have in the shop for walk-ins every day is cake balls, regular and Boozeballz (cake balls with liquor, not baked out). We have the largest selection of any other bakery for cake balls that I am aware of. With regular, Boozeballz and seasonal flavors, we have over 80 different ones! The creativity of my girls is truly amazing. They have produced some amazing, edible works of art! My proudest moment is realizing we have to expand to the 3rd store not because we want to, but because we need to. We have simply run out of room. We hate turning down orders, but we just book up so fast. With this new space we will be able to hire more people and take on more orders.